The May Bank Holiday has arrived! What a great opportunity for some rest and relaxation, and also to enjoy the outdoors, maybe in the garden or local park. 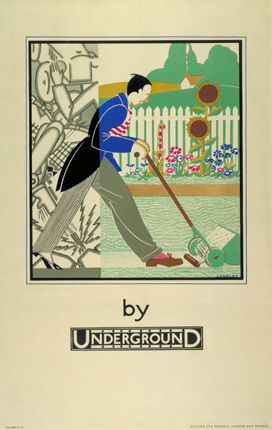 This week’s poster is ‘Gardening by Underground’ by Stanislaus Longley from 1933. Posters like this were used to entice city-dwellers to move to the relative peace and tranquillity of the suburbs. Longley’s poster shows us how suburban living can be the best of both worlds. With one foot in the bustling, hectic city and another in his beautiful private garden, the man in the poster is living the suburban dream. London’s suburbs grew around the ever-expanding Underground network. Golders Green became the first Tube suburb when development began in 1907 and was based around the rural terminus of the Hampstead Tube. 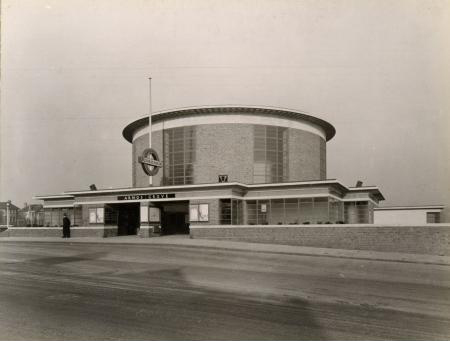 Extensions to the Piccadilly line in 1932 and 1933 prompted the further expansion of suburbia. The architect Charles Holden’s futuristic-looking stations sprung up in north and west London to carry passengers into town on the sleek and modern Underground, surrounded by brand new, but traditionally styled, suburban housing. The new suburbs offered spacious homes and private gardens, and proximity to the countryside was also a huge draw. London’s countryside looks great at this time of year. If you need any inspiration about where to go this bank holiday, why not come and have a look at some of the posters in our exhibition, Poster Art 150? We’re open all weekend! Wherever you decide to spend it, have a great time!